13 million people participate in kayaking each year [AmericanCanoe.org). It’s a popular sport. In fact, it’s more popular than canoeing (10 million participants), rafting (3.8 million participants) and stand up paddleboarding (2.8 million). The average kayaker heads out on the water 8.1 times per year. My wife and 6-year-old son are "kayak participants.” We own a tandem kayak. The thing is a beast, but it’s awesome. We used to live one block off of Crescent beach so we could wheel it to the water in under 5 minutes. Now we live a 10-minute drive to the beach which means hoisting it onto the roof rack, driving to the beach, finding parking and then hauling it to the water. I loathe hoisting stuff onto roof racks, especially a monster kayak. Needless to say we don’t use it anywhere nearly as often as we used to. This past summer our 6 year old son captained his own mini-kayak on his own for the first time. He absolutely loved it. Which means we’ll probably be hauling our tandem out to the beach much for often in the future. You got it. It’s along the side of the house. Fortunately, we have a retaining wall with enough surface area to store the kayak. However, it’s outdoors which isn’t ideal. I pressure washed it this year, but we really need to store it properly. 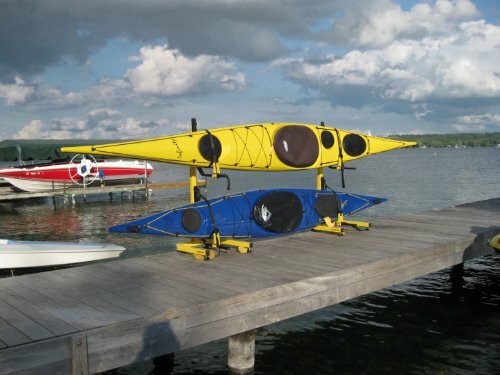 Hence the inspiration for this article setting out kayak storage ideas. Racks are great because they’re easy to set up and you they’re portable. You can move them from inside to outdoors from your main residence to a vacation home. 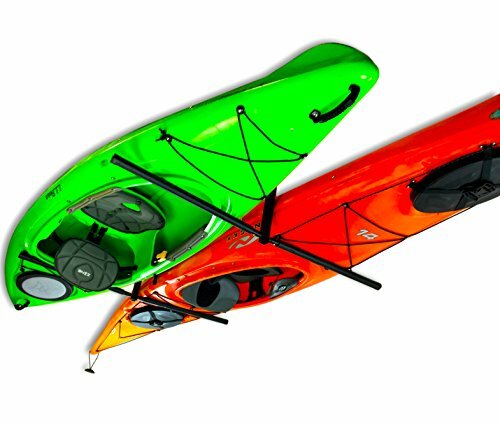 The small 2 kayak rack below can easily be transported wherever you go. As you’ll see below, there are 3 types of kayak racks. Most people don’t need to store 6 kayaks which this rack can do. However, if you have the floor space, this is a really convenient way to store them. You just might be able to store other things if you only have one or two kayaks. If you have a stand up paddleboard or two, that would work on this rack. Another option is it could be used to store all the accessories such as life jackets, rope, watertight storage bags, water pump etc. 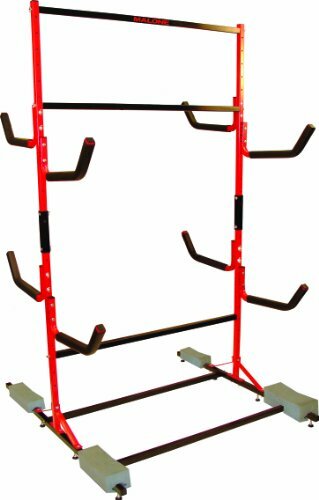 If a 6 kayak rack is too much, here’s a compact 2 kayak storage rack with total weight capacity of 175 pounds. 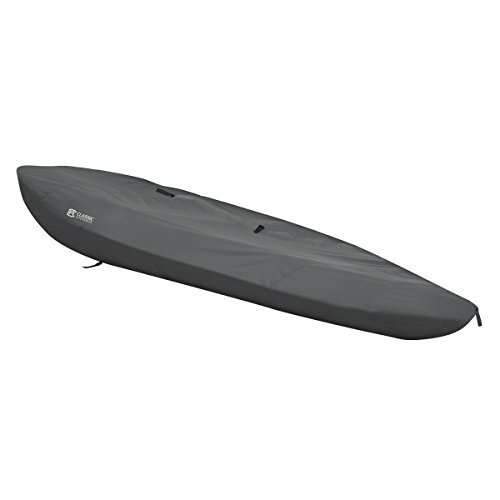 It doesn’t take up much space and is super easy to toss your kayaks onto it. Another plus is you don’t have mount this to a wall or ceiling. Not only is it easy to set up, but you can move it around as necessary. This rack is nice because you can adjust the distance between each end. This might be the best option for long kayaks. 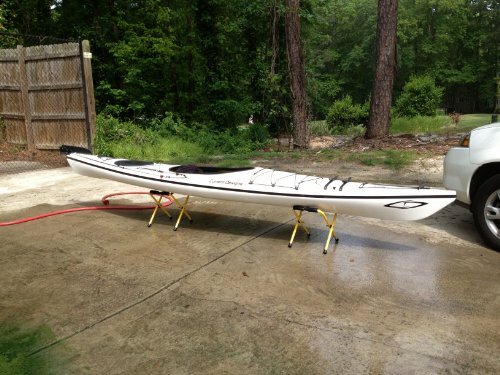 You can set this up in a garage, basement or use as outdoor kayak storage. If above is your kayak storage preference, this is a good option because you can store 2 kayaks and it stores them snuggly against the ceiling. In other words, it doesn’t hang down much at all unlike suspension style options. 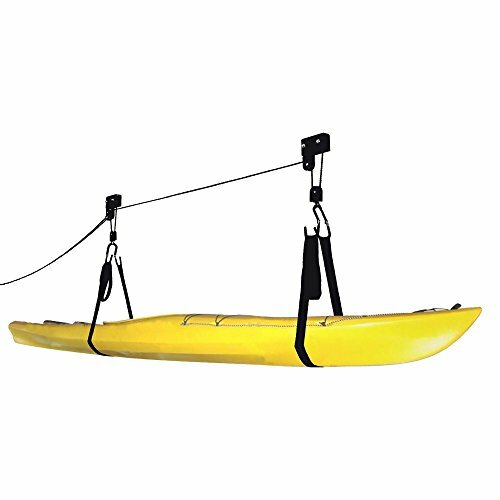 This pulley hoist kayak storage system can hold up to 125 lbs. which is more than enough for a kayak. FYI, it also accommodates a canoe instead of a kayak. 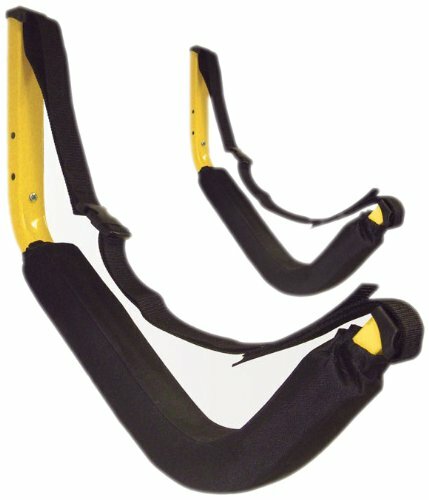 This hook-style rack mounts to walls, fences – anything that you can bolt to and can hold the weight. This isn’t really ideal, but it’s better than on the ground. You’d probably want a storage bag or a tarp with this. 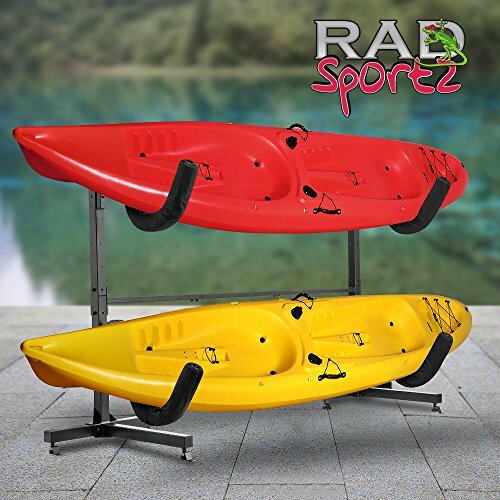 Also, if your kayak is really long (like ours) it may not fit in your garage or basement which leaves you no choice but a storage stand with a cover of some kind. Here’s an example of a kayak storage shed. You probably don’t need to store that many, but it gives you an idea of what you could build. We used to live in Crescent Beach, British Columbia. It’s a gem of a village nearly surrounded by the ocean. The sunsets are spectacular. It’s a super easy place to launch from. Check it out. There are several launching spots in North Vancouver. Our favorite is Deep Cove but it’s hard to find parking. Another spot is Cates Park. Here’s Deep Cove, a terrific little village area on the water in North Vancouver. Copper Island in the Shuswap in BC.